Abu Qader ’21 is just settling into his room at Mary Donlon Hall. Like any new Cornell freshman, he’s been spending lots of time joining clubs and hanging out with new friends on his floor. But unlike lots of freshman, Qader is also running a company, GliaLab, which is developing software that can improve the accuracy of breast cancer diagnoses, especially in developing countries. He’s been featured by both Google and TedX Teen, talking about his work and his passion for combining computer science and health care. But Qader doesn’t always talk about life in terms of math, economics or computer science. He has personal reasons for his quest to make the world a better place. Qader has been deeply affected by his parents, who moved to the U.S. from Afghanistan when he was young. That takes a certain amount of courage,” he said. “It makes me feel blessed and privileged and it makes me want to do things.” And he said he feels a calling to use his computer skills to do something more important than making money. “You should be able to trust that what your health care provider says is accurate, but in many developing countries, the hospitals don’t have trained radiologists. We can give them the advantage of having first-world technology,” he said. GliaLab is developing software that uses data on breast cancer tumors to build predictive models, which enable lower, cheaper and less invasive methods of breast cancer detection. Qader plans to expand the software for use with other cancers and diseases. Though he’s busy with classes, clubs and social activities, Qader feels compelled to spend a good chunk of time on his company. GliaLab is securing hospital partnerships and hoping to release a beta version of its software early next year. 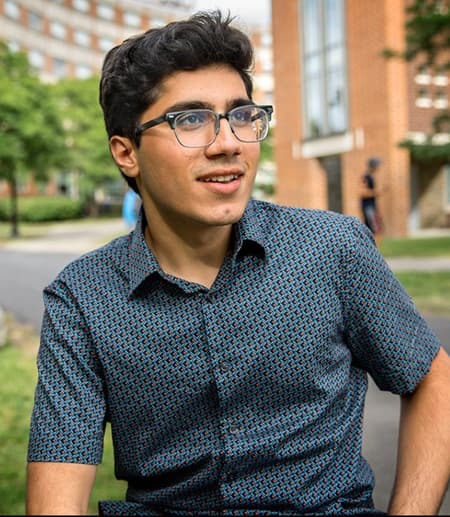 Qader grew up in Chicago and comes to Cornell as part of the Posse class of 2021. The Posse Foundation founded the Posse program in 1989 to identify students from urban high schools with great academic and leadership potential who might have been overlooked by traditional college selection processes. Students are given scholarships to attend college in a “posse” of 10 that serves as a support community. Qader said the Posse program is well-known in Chicago. Among Posse’s partner schools, Cornell was his first choice because he thinks it’s a school where he can stretch his intellectual capabilities and broaden his entrepreneurial experience. During a visit last spring, he met with professors to discuss research options, something he’s excited to begin. As a young entrepreneur, Qader’s expertise is in high demand. He was invited to a Google I/O developer conference in May, where they showed a video telling his story, and he was a featured speaker at a TEDxTeen event in London in June. He’ll also be at the O’Reilly Artificial Intelligence conference in September and the Misk Global Forum in November in Riyadh, Saudi Arabia. Along with his health care and computer science focus, Qader also shares his code on Github and his computer science knowledge with younger students, particularly those who want to start companies.